Almost 75% of Iraq's population live in the flat, alluvial plain stretching southeast toward Baghdad and Basrah to the Persian Gulf. The Tigris and Euphrates Rivers carry about 70 million cubic meters of silt annually to the delta. Known in ancient times as Mesopotamia, the region is the legendary locale of the Garden of Eden. The ruins of Ur, Babylon, and other ancient cities are here. Iraq's two largest ethnic groups are Arabs and Kurds. Other distinct groups are Turkomans, Chaldeans, Assyrians, Iranians, Lurs, and Armenians. Arabic is the most commonly spoken language. Kurdish is spoken in the north, and English is the most commonly spoken Western language. 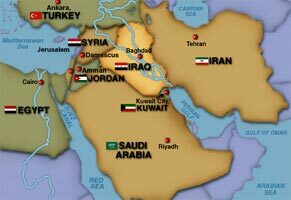 Most Iraqi Muslims are members of the Shi'a sect, but there is a large Sunni population as well, made up of both Arabs and Kurds. Small communities of Christians, Mandaeans, and Yezidis also exist. Most Kurds are Sunni Muslim but differ from their Arab neighbors in language, dress, and customs.